Microsoft Security Essentials Free Download 2016 Edition latest version 4.9.0218.0 for Windows 32/64 bit. Get Microsoft Security Essentials offline setup, standalone installer. Microsoft Security Essentials is a free antivirus solution provided by Microsoft to protect against multiple types of dangerous viruses, rootkits, trojans and spyware. This application offers real-time protection having good efficiency and relative low resources consumption. You always will be alerted when threats are found in your computer. It comes with rootkit protection, stoping this type of malware to take control over your computer and spreading further. The kernel engine is monitored all the time to identify if any changes were made on it by any malware. The user interface is clean and displays the status of the protection engine and other interesting things like scanning methods, update engine, history and settings. You have 3 available scan methods: Quick, Full and Custom scan. 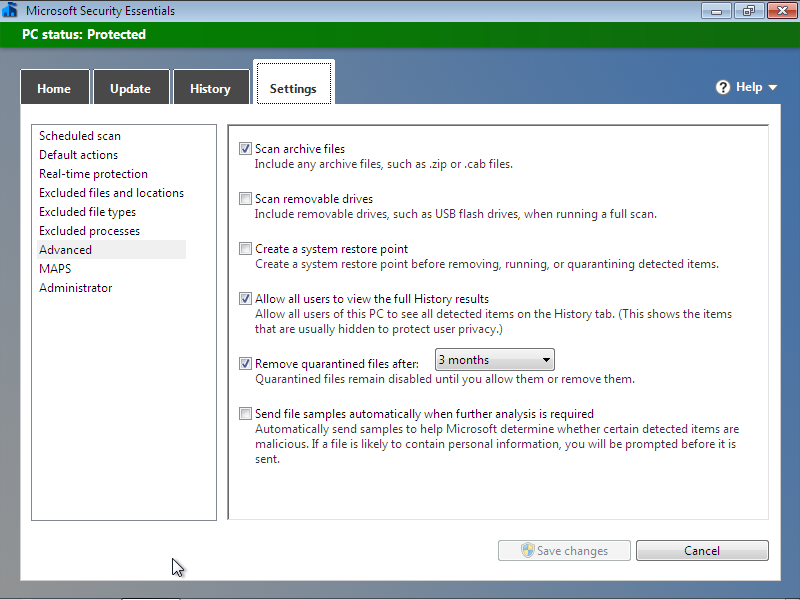 Like other antiviruses, the Quick scan searches for malware in the most common infection places like memory, registry, system files and applications and services that start on system startup. The full scan checks everything located on your computer without omitting something. If you’re interested only in scanning certain files, folder and locations, you can use the custom scan. The possiblity of scheduled scans is present here and is also available in other antiviruses like Avast Free Antivirus and Kaspersky Antivirus. When a potential infection is found on a computer, the user is prompted with a window where the infection is labeled with a threat level and a recommended action to be taken against. 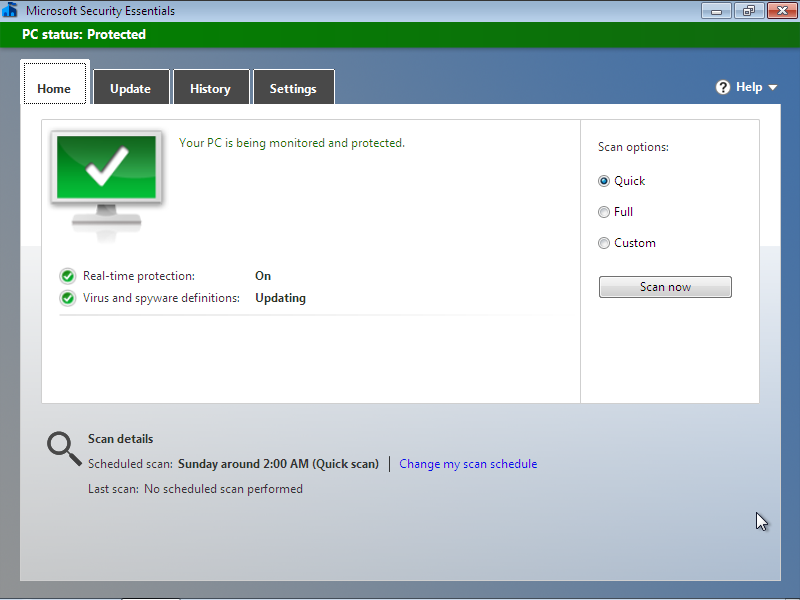 When the system is detected as idle, Microsoft Security Essentials will start a scan. Threats which are low dangerous are placed in the Quarantine where the user can restore or delete them forever. You can also configure how the application behaves when it detects a intrustion by changing the default actions in Settings. The program comes after installation with the optimal settings and it will run an update and a quick scan. Simple and intuitive user interface: all the basic information and components are displayed on the main window. 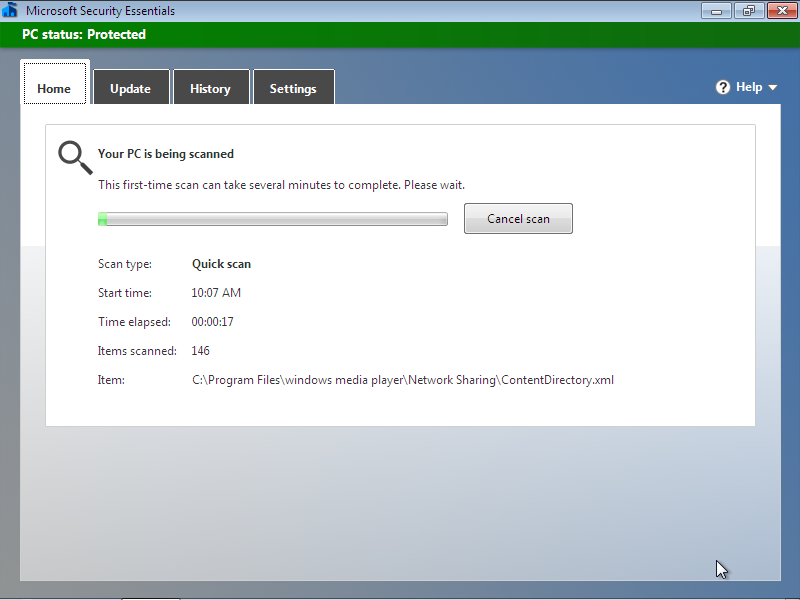 Consistent updates: the application will always have the latest virus signatures and updates for the antivirus engine. Fully free: you don’t have to pay for extra modules and components. Real-time Protection: the activity on your computer is always monitored. Click the link below to start the Microsoft Security Essentials Free Download Latest Version 4.9.0218.0. If you have any problems while downloading please leave a comment below. After the page opens remember to choose the “Download through your browser” option to start downloading Microsoft Security Essentials Offline Installer, Standalone Setup.